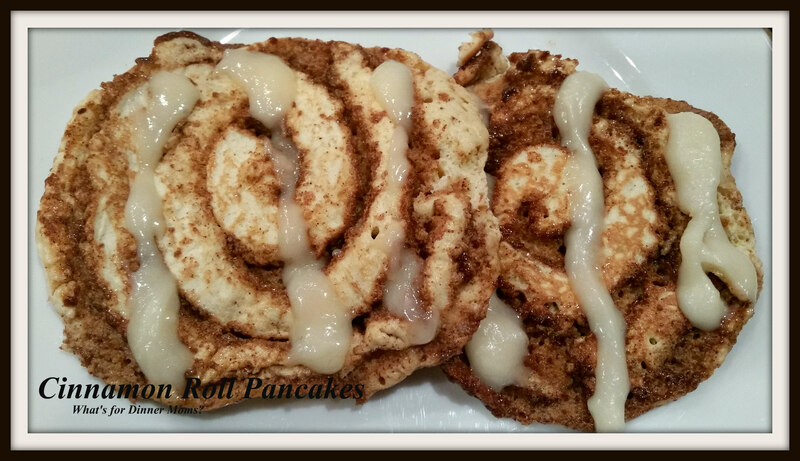 Cinnamon Roll Pancakes – What's for Dinner Moms? There was a video on Facebook and on Pinterst last year showing pancakes similar to these that looked so simple to make. Now they were perfect little cinnamon roll looking but I haven’t been able to make them like they do. We adapted this recipe for us and it works. They are not beautiful but they are one of our favorite pancakes ever. This was one of those dishes that the kids were a bit skeptical about because it did not look anything like those beautiful videos that have been circulating for years. I did cook them low and slow to try to get the perfect pancakes but this was the best I could do. The kids tried them and declared them the best pancakes I have ever made. Considering we have pancakes once or twice a month I think they were great! I preferred my pancakes without the cream cheese frosting but with butter and maple syrup. My son said, “Dessert for dinner!” He wasn’t wrong. Preheat oven to 170 degrees or keep warm and place a cookie sheet in the oven. Prepare cinnamon filling by mixing all the ingredients together in a small bowl until well blended. Place ingredients in a ziploc bag and place in refrigerator until ready to use. You want it firm but not too hard that it doesn’t squeeze easily from bag to make cinnamon rings. Prepare pancakes by mixing flour, baking powder, and salt in a large bowl. Add in half and half, oil, and eggs. Stir to well blended. There may still be a few small lumps but that is okay. Prepare cream cheese frosting by beating together all ingredients until smooth. Set aside. Heat a large griddle or skillet over medium low heat. Brush skillet with butter or non-stick cooking spray. Cook by 1/3 cups. Once batter has been put down using the baggie with a small corner cut off gently squeeze a cinnamon swirl patter over the pancake. Let it sit and the pancake is supposed to rise over the cinnamon swirl. But, in mine this didn’t happen. When you flip them be careful that the cinnamon sugar doesn’t burn to your pan. You only want to flip them for a little bit to cook the remaining side. Remove pancakes from pan and place in oven to keep warm until all pancakes are cooked. Serve hot with a cream cheese frosting drizzle or butter and syrup as desired. When I try to make something from one of those videos it rarely turns out looking as nice. But these sound tasty. These were no where as good as the video. Those looked like regular cinnamon rolls. When I read comments most people’s in all the different recipes I looked at did not come out looking perfect like their pictures. That’s a very special idea, Marci! These look fab! I’m sure they tasted delicious! Thank you. They were yummy! I may just have to attempt these – looks amazing! The ones in the videos I saw were lovely. Mine tasted great but didn’t look as good. I think these pancakes look wonderful, Marci. Great job!